Here is a card for Christmas. I am stepping out of the box with this layout. I don't usally use multiple DSP on one card. I think it turned out good. 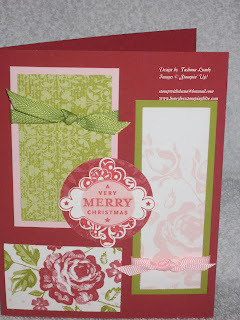 The main image is from Punches Three stamp set, a Level One Hostess Set. I used the Scallop Square punch to punch the image out and mounted it on top of a 1 3/8 circle of DSP with a diminsional. Some colorful ribbon to match and Wala, a Christmas card. ........Hey, did you notice that I used the punch template to shade the sentiment with Pink Pirouette?